In 2011, Google introduced the term Zero Moment of Truth to describe how people shop. A ZMOT is someone’s subjective experience with a product that, when shared, influences another person’s purchase decision. While the term is new, the concept is not. It’s a modern-day version of word of mouth rendered for the digital age. 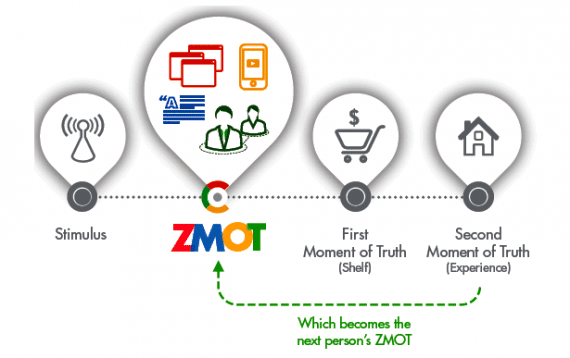 Zero Moment of Truth is a term Google coined to describe today’s shopper journey. Social media provides shoppers with ideal channels for sharing their moments of truth journey. Here are five ways merchants can leverage it to promote ZMOTs. Go Multi-screen. A Google study looked at all the screens consumers use over the course of a week and found that 90 percent of media interactions take place on a smartphone, laptop, PC, tablet or television. Radio and print account for only 10 percent. Black Friday and Cyber Monday proved that mobile commerce is now a force in online shopping. According to one report, over the two shopping days of November 28 and 29, nearly one out of every four online sales dollars occurred on a mobile device. Mobile use isn’t relegated to shopping either. A survey from Adobe found that 71 percent of online users access social networks via a smartphone or tablet. On Facebook alone, more than 751 million users visit the site using one of those devices. With these statistics in mind, ecommerce merchants can ill afford to overlook the impact of mobile on shopping and, coupled with that, social media’s influence on purchase behavior. Incorporate customer ratings and reviews. Customer ratings and reviews are a way to educate customers and keep them on your site rather than going elsewhere to conduct product research. They provide reassurance to people during the purchase process and help customers discover products that best fit their needs. Therefore, ratings and reviews are an excellent way to promote sharing that produces ZMOTs. Some ecommerce platforms include a rating and review component. In the event yours does not, four affordable options are: Rating System, Reziew, Gigya, WP Customer Reviews (WordPress plugin). Add social sharing icons. Use Facebook Like, Tweet This, Pin It and Google +1 buttons on product pages to facilitate social sharing. This is yet another way to promote ZMOTs. Set Up a YouTube channel. Sixty-eight percent of consumers report using YouTube to browse and research retail companies. Utilize that channel to promote behind-the-scenes, customer testimonial, and product how-to videos. From a search marketing perspective, YouTube is the second largest search engine owned by the largest, Google. It makes sense to be present there for that reason alone. 5. Implement a branded online community. Bring customers in-house where your brand and products are put front and center without the distractions found on social networks. Social media provides a place where consumers can easily share opinions and recommendations about products. Google’s Zero Moment of Truth concept emphasizes the importance of social sharing and its effect on purchase behavior. When implemented, these five ideas can help increase the amount of sharing that takes place around your brand and products.